Snuggle up in a chair with your tea or cocoa and immerse yourself in a Christmas book that combines a touch of mystery with an abundance of good will and cheer. I just wanted to keep reading this. It's written from the perspective of an eleven year old girl with a very big vocabulary and a very big heart. Sometimes as adults we don't really see what is going on around us. We're too busy with the business of life. Sometimes a child, an elderly person, or, if we take time to truly observe and listen, even we ourselves can see real needs for kindness, love, attention, time. Last year, I read Christmas at Grey Sage. It was a balm to my soul during a difficult time of my life. I didn't want it to end. The characters just drew me into the story in such a way that I wanted to know what happened next and next and next. 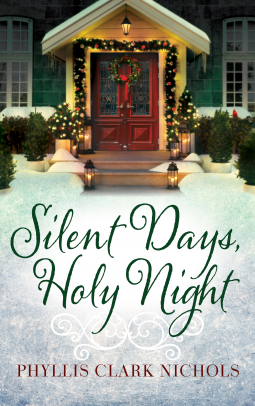 Silent Days, Holy Night is just like that. The Russell family is a giving, loving family, that has taught service and caring by example. It's what I've tried to do with my children as well. This is a book that captures the spirit of Christmas—kindness, friendship, and the love of Christ. I highly recommend this book. It sounds wonderful! I'm trying to read pleasant books before bed these days because they relax me and leave me with good thoughts before falling asleep. As for the 11 yr. old perspective, I'm sure I'd love that. I got addicted to a series of books by Alan King, featuring 11 yr. old Flavia de Luce. They live in the English countryside after WW2 and they're mysteries. I listen to the unabridged novels on CD while I'm embroidering and the reader is great. The first book is called The Sweetness at the Bottom of the Pie. You might enjoy them! I hope I can find this book you spoke of. I was glad to see a new post from you! Thank you for the book suggestions Debby. I just ordered the first book on CD through inter-library loan. I'm looking forward to it. ​Debby in Kansas suggested an audio book. I ordered one to listen to while I work. Great Thanksgiving. It was peaceful and calm... until we hit a deer on the way home that night. I think the van is totalled, but everyone is okay. God protected us. Sounds like a great book! I hope you and your family have a wonderful Christmas season! Why thank you Cheryl! I'm sorry that I've been out of the loop for a few weeks. I hope that I can get more involved over the next few months. Be blessed my friend. May God comfort you and your family as you go through this holiday season with loved ones in Heaven. Bless you, and thank you for talking back even when I've been rather unresponsive the last few weeks. You've really stuck with me through everything. That means a lot to me. Hugs! SMArt Momma about bringing a book everywhere. You just never know. I started carrying a Reader's Digest in my car for that very reason. The short stories are convenient in case I don't pick it up for a month. I once got stuck at a RR crossing for 20 minutes because of a problem. I was near the front so I couldn't go anywhere. I turned off my car, sipped my coffee and read. What I could've used was a toilet!! I've learned to be patient in waiting. Bringing a book or my knitting helps a lot. It's also a good time to pray! I can't help with the toilet situation, though it's sometimes a problem!